India witnesses four seasons- Winter, Spring, Summer, Monsoons. 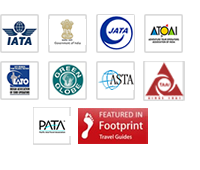 Into Mumbai – Cathay pacific, Etihad Airways , Gulf Air, Jet Airways, Egypt Air, Thai Airways, Alitalia, Air France, Kuwait Airways, Air Canada, Singapore Airlines & More. On arrival at the airport you will be guided to the immigration counters, then to baggage belt & exit after customs where our executive will be waiting to receive you with your name placard. Malaria : - Recommend prescription if visiting low altitude area especially in monsoons. Yellow Fever : - No risk of yellow fever in India. If you are traveling from country with yellow fiver risk, then carry yellow fever vaccine certificate.